Unless otherwise specified, the large pictures on this page are of engines in the collection of The Upstairs Train. Click on an engine to see the train(s) it pulls. #472 Sante Fe Alco A Unit made only in 1956. It is a single-motor A unit. There is no dummy A or B unit. Bob Bubeck reports "There is only one known example of the Rocket 476 B unit." 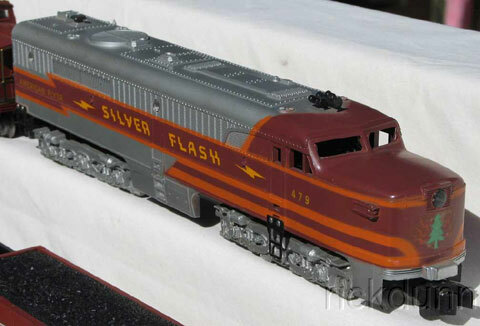 The #479 Silver Flash Alco A Unit made only in 1955. It is a single-motor A unit, sold with no dummy. 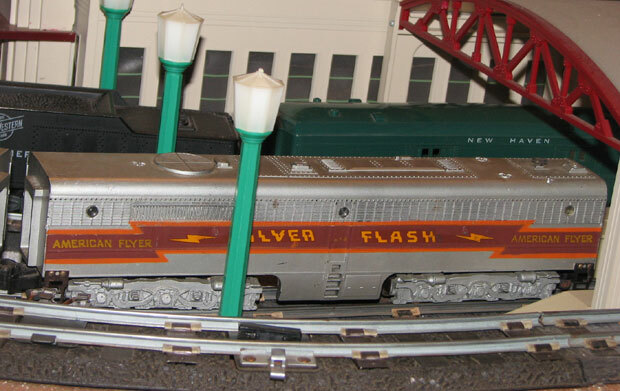 The extremely rare #480 Silver Flash Alco B Unit made only in 1955. 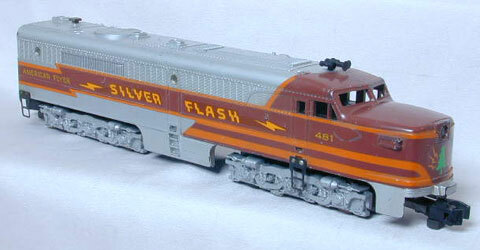 The #481 Silver Flash Alco A Unit made only in 1956. It is a single-motor A unit, sold with no dummy. #497 New Haven A Unit made only in 1957, sold with no dummy. #4713 silver painted Santa Fe Alco engine set made from 1954 to 1957. It comprised a #470 dual-motor A unit, #471 dummy B Unit, and #473 dummy A Unit. A chrome version was made in 1953. Here's a close-up of the B-Unit. 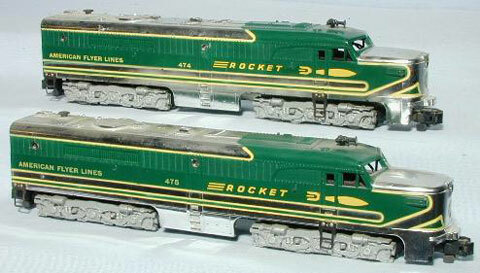 #4745 chrome Rocket Alco set made in 1953. It comprised a #474 dual-motor A unit and #475 dummy A Unit. I have the silver painted version made from 1954 to 1955. 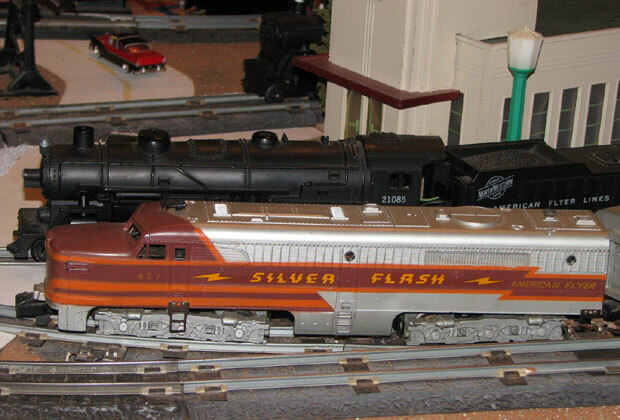 The rare #4778 silver painted Silver Flash Alco set made only in 1954. It comprised the #477 dual-motor A Unit and #478 dummy B Unit. #477 Silver Flash A Unit made only in 1954. 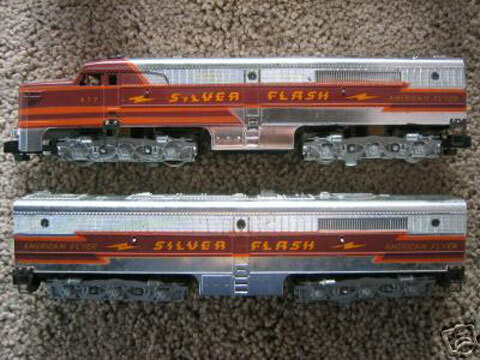 The distinctive front of the #477 Silver Flash A Unit. #478 Silver Flash B Unit made only in 1954. An equally rare chrome version was made in 1953. 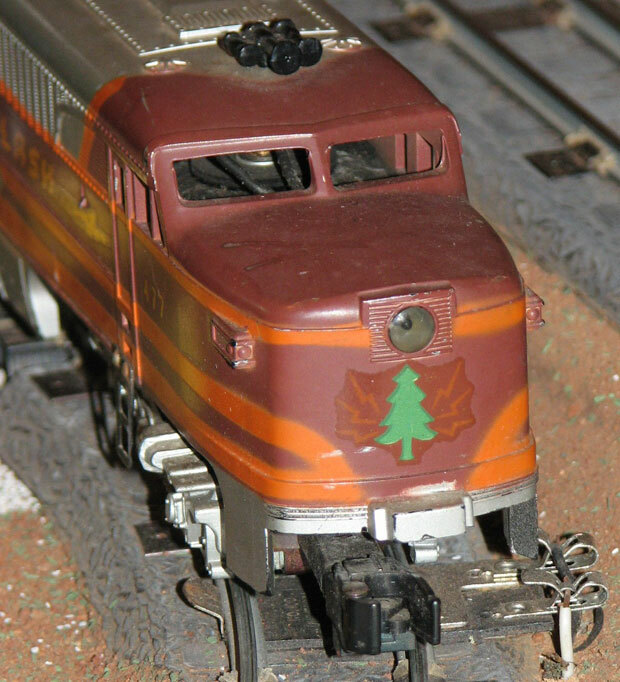 The somewhat rare #4856 Santa Fe Alco set made from 1956 to 1957. It comprised a #484 dual-motor A unit, #485 dummy B Unit, and #486 dummy A Unit. 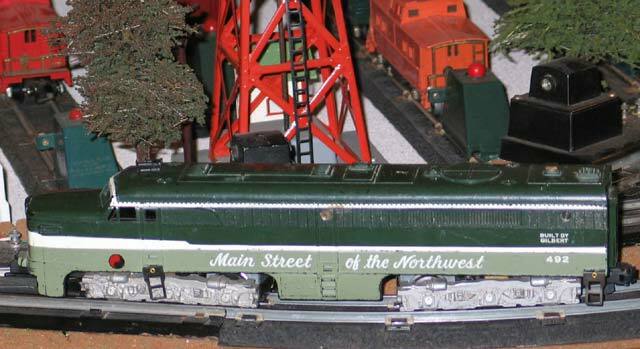 The rare #4913 Northern Pacific Alco set made only in 1956. It comprised a #490 powered A unit, #491 dummy B Unit, and #492 dummy A Unit. What I have is a #492 Dummy shell on a powered chassis. 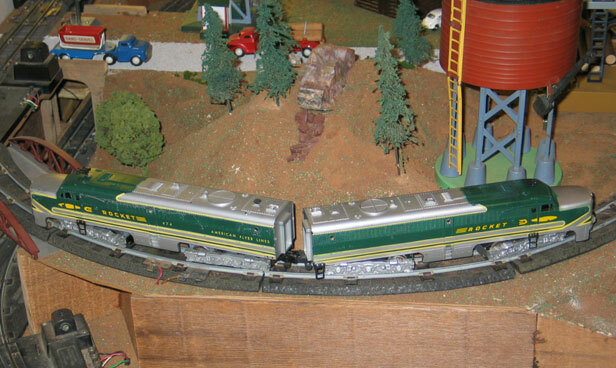 The rare #4945 New Haven set, comprising a #494 dual-motor A unit and #495 dummy A unit, made only in 1956. There was no B Unit. Show me the rest of the Alcos.